Cover to the Folder: This was the picture on the front of my red folder in which I handed my project in. The title picture on the main page was based off of this. Cover to the Introduction: As said, this was the cover to the introduction explaining what the SSoAGMA was. Actual Intro: Here's a picture of what the intro looked like. You can ignore the prices. Listing prices was part of this project. Cover for the Direct Mailer section: This was the cover to the Direct Mailer. A direct mailer is another word for a flyer. The title picture on the History page was based off of this part. Acutal Flyer: This is the direct mailer (flyer) I had to make. Some of it's in color, but I print it out in black and white. Cover to the Newspaper Ad: This, well, obviously, is the cover to the newspaper ad section. As you can see, the title picture for the Members page was based off of this cover. 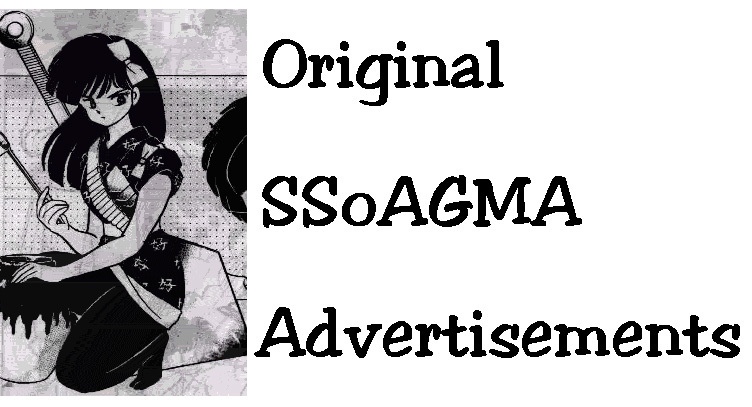 Actual Newspaper Ad: This is the newspaper advertisement part of my project. This is also my personal favorite part of the project, since I like how it looks ^_^. Cover to the Radio Ad: Yes, I actually had to make and record a radio advertisement. This is the cover to the radio section, where it held the script of the radio ad. The title picture of this page was from this ad cover. Actual Radio Ad: Here's what was said in the radio ad. 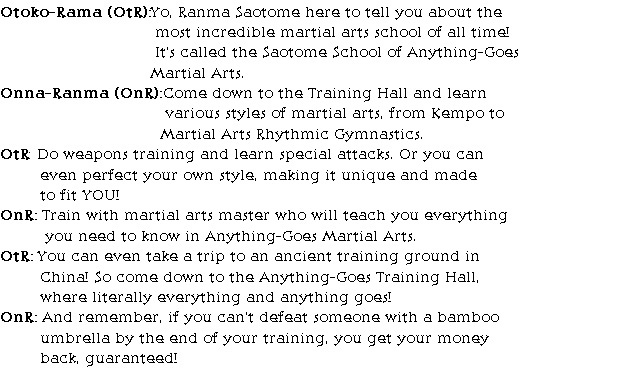 I played the part of Otoko-Ranma, and I had my sister do the Onna-Ranma part. (I sounded pretty bad, even though I'm usually good at doing his voice). I made all of these myself, so I take all the credit ^_^. But I would like to give a huge thanks to Frank for helping me with this project by giving me feedback on things. Arigatou Frank! !